It's a happening joint here at Bjava! 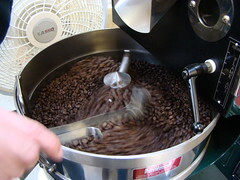 We are really moving some great Fresh Roasted coffee! Come on in and get it while it's fresh! We have a small amount of Kona on the shelf right now, but if you want to make sure you get some then Please stop in or call tomorrow and get your name on the list! It is going fast! See you tomorrow or one day next week! Christmas is Friday, and you know you don't want to forget "that" person on your list who loves GREAT coffee! Kona Coffee is almost here! Stop in and place your order today! Check out our great Christmas treats! We have some of your favorite flavored coffees. Our Holiday roast will be on the shelf before the end of the week! Gift baskets, French presses, Tea brewers, get what you need here at Bjava! See you soon for a yummy Peppermint Mocha or a Tres Leches Latte!